The easiest way to build microservices and cloud-native applications with the power of RSocket. 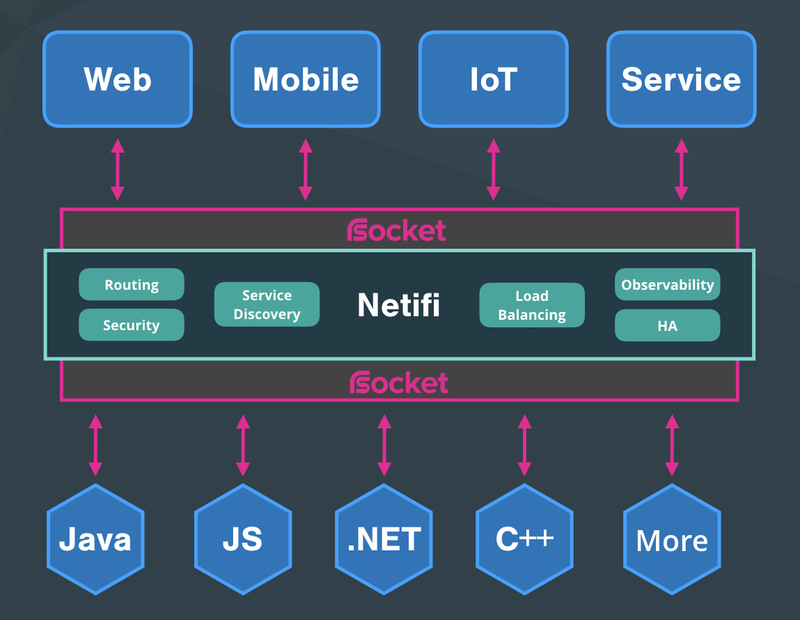 Netifi is the next-generation reactive microservices platform, built on RSocket, that allows developers to focus on their product by transparently providing API management, routing, service discovery, predictive load balancing, and ultra low latency RPC in a single deployable. Netifi forms the central nervous system of your cloud-native and microservice architectures, allowing any device or service to communicate with one another seamlessly on any platform. Netifi Community Edition is free to use, open-source, and licensed under the Apache License 2.0. Netifi is the easiest way to build performant, secure, and reliabile microservices. Netifi enables your web and mobile apps to have their own API that can be called by services and devices. Netifi simplifies cloud-native architectures by providing everything you need in a single deployable. Simple service discovery that works with browsers, mobile devices, and services. Just tell the SDK where you want to go and we take care of the hard work. Predicts downstream latency and routes traffic to the best destination. Automatically detects and routes traffic away from unhealthy instances. Forget HTTP and GRPC. Communicate between your services with the fastest and most advanced application RPC protocol developed. No need to setup Spark. Easily create and deploy stream processing functions to the Netifi platform in any language you wish. No need for circuit breakers. Applications are automatically protected from receiving more traffic than they can handle with built-in backpressure preventing outages. Develop, deploy, and manage functions to enrich messages flowing through the platform. Unlike other competitors, Netifi functions can share state across requests. Discover, share, and manage APIs via strong contracts with versioning. Ditch Swagger documents and take advantage of self-documenting Netifi RPC contracts. Netifi RPC implements the Reactive Streams protocol. React to application changes in realtime without the need for inefficient long-polling or pub-sub messaging. RSocket + Netifi dramatically simplifies the way you build and operate cloud-native systems. Netifi is like no other microservices offering on the market. Service mesh agents and application sidecars are bandaids on top of a fundamental 1 problem. Unlike competitors, Netifi does not require you to run agents or sidecars on every instance, because Netifi transparently works at the network layer. RSocket RPC, our custom application communication protocol, is 40% faster than gRPC and 200% faster than HTTP with dramatically better P99 latency. Netifi RPC supports sending arbitrarily large binary messages over the network. Unlike with our competitors, there is no need to encode binary messages in JSON format before sending them to recipients. Binary message support increases efficiency and allows for higher throughput applications. No need for circuit breakers. Netifi applications signal how much traffic they can handle in realtime using the backpressure support built into Netifi RPC. Applications are only sent the amount of traffic they can handle preventing embarassing outages. With Netifi there is no need for painful client-side load balancing or setting up software load balancers. Netifi utilizes advanced predictive load balancing techniques that actively monitor downstream throughput and route requests accordingly. Route requests to devices, services, and even individual user's web browsers anywhere in the world. All clients connect into the Netifi routing network which means you are capable of routing to any device or service even if they do not have a public IP address. Netifi is supported on all of the most popular platforms and can be deployed in cloud, on-premises, or hybrid configurations. Take your microservices to the next level with Netifi Enterprise, the commercially supported version of the Netifi platform. Netifi Enterprise provides a wealth of useful features and connectors for getting the most out of your microservices architecture. Try Netifi Enterprise for free and see just how easy building and managing your cloud-native architecture can be.